Online ordering menu for Quiero Cafe. 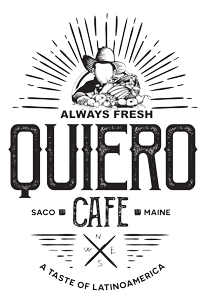 Come to "Quiero Cafe" in Saco, Maine for savory Latin American cuisine! Our tasty menu features Empanadas, Burritos, and Tamales. We also serve several kinds of coffee, smoothies, and Tropical juices. Don’t forget to try out our Desserts! Find us at the corner of Main St with Pepperell Square. We’re also conveniently located near U.S. Postal Service office and the U.S. Social Security office. Order online for carryout!